Treasury and Finance Minister Berat Albayrak speaks during his meeting with press members in Ankara, Feb. 6, 2019. In almost every discussion last year, politicians and economists could not help but get drawn into debates about shocks, volatility and turmoil in global and domestic markets. As one of the leading emerging markets, Turkey was not exempt from these talks, particularly in August and September when currency fluctuations, inflation and high interest rates were the top agenda items. Mitigating risks and fortifying its susceptibility to external shocks and political threats, Turkey enjoyed stability in markets in the last quarter of the year and the efforts panned out in the first month of the year with a strengthening lira, falling interest rates and more positive indicators for inflationary trends. With such developments, 2019 offers many great opportunities for the Turkish economy, Treasury and Finance Minister Berat Albayrak said Wednesday. At a meeting in the capital Ankara, Albayrak comprehensively evaluated 2018 and stressed that the precautions taken with agility during the turbulent period in the summer have laid the foundations for a strong financial structure. "The measures we have taken so far have enabled us to start preliminary work on a stronger financial structure and ramped up our immunity against political and financial shocks," Albayrak said. As a result of a series of initiatives, campaigns and well-designed debt-collecting strategy, Turkey started the new year with lowering inflation, dropping interest rates and a stronger lira, he stressed. Albayrak also pointed out that the rebalancing period delivers a better-than-expected performance. "We are expecting that 2019 will outperform previous estimates. We are all going to observe more visible improvement in the economy as of April. I believe 2019 will bring along more opportunities as well as threats," Albayrak said. d by structural transformations. Following the municipal elections of March 31, we are planning to execute changes in organizational structures in a coordinated and efficient way," the minister noted. Albayrak also emphasized that he believes the country will reach its growth target for this year set in the New Economic Program (NEP), which was announced late September, without any problems. In the roadmap for economic rebalancing for the period 2019 to 2021, NEP expects 2.3 percent GDP growth in 2019. The program projects the economy to grow 3.5 percent in 2020 and 5 percent in 2021. Speaking of global risks, Albayrak stressed that the latest U.S. Federal Reserve (Fed) decision to keep interest rates unchanged is an opportunity for emerging markets like Turkey. The minister also underscored that the Fed's decision has debunked arguments claiming that the 2008 financial meltdown was utterly overcome. The markets still need support with loose monetary policies. Devising a borrowing strategy that is geared toward reducing costs and interest rates, the Treasury and Finance Ministry issued bonds denominated in euros and dollars, which received high demand from foreign investors. According to yesterday's data, the yield for the 10-year government bond was 14.08 percent. Under Treasury and Finance Minister Albayrak's guidance, the Turkish Treasury has moved to limit lira bond supply to restrain yields after a market slump last summer. It has not sold a benchmark 10-year bond denominated in liras since July. "Our treasury management aims to decrease borrowing costs and correct the use of liquidity," Albayrak said. The Treasury saved nearly TL 3 billion in interest rate expenditures in the last quarter of 2018. Five-year government bond yields maintained a downward trend at 15.19 percent, while the two-year bond had a 17.69 percent yield yesterday, which fell by 111 basis points in January. The Treasury previously announced plans to borrow in Chinese yuan with panda bonds and samurai bonds denominated in Japanese yen. The minister also drew attention to Turkey's credit default swaps (CDS) that have recorded profound improvement in the last couple of months. According to yesterday's data, Turkey's CDS was down 4.05 percent at 292.46 points. Minister Albayrak also said the Treasury receives high demand from abroad for the issuance of 30-year government bonds – a strong indication of the confidence reinstated in the Turkish economy. The country's annual inflation went up 0.05 percentage points from 20.3 percent in December 2018 to 20.35 percent in January of this year. The slight increase stemmed from the rising food prices due to demand shocks emanating from seasonal conditions. 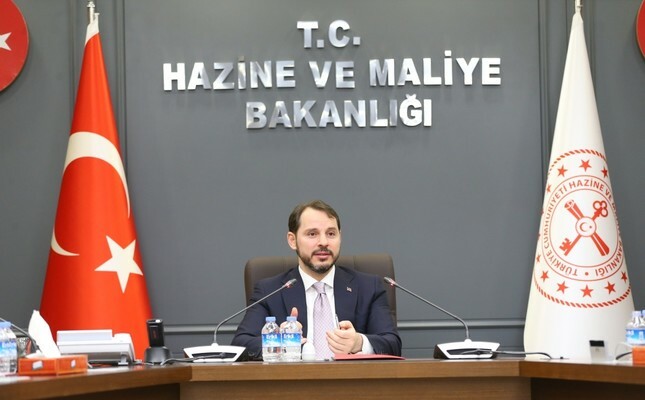 Albayrak explained that if food prices remained unchanged from December 2018 to January 2019, inflation would have been recorded at -0.43 percent and annual inflation would have been around 18.85 percent. To ensure stability in food prices and boost agricultural productivity, the government will announce an investment package to transform the greenhouse infrastructure, Minister Albayrak said. State-lender Ziraat Bank will announce the new investment program at the end of this week or early next week, he added. In order to fight inflation, the Treasury and Finance Ministry in October prepared a full-scale program to fight inflation, spearheaded by Minister Albayrak. The program included a 10 percent cut in prices of certain retail products and consumer loans. In addition to this program, the government also introduced tax reductions in real estate, automotive, furniture and home appliance sectors. These efforts, coupled with tight monetary policy and supported by falling commodity prices, have tamed inflation to a certain extent in the short term. "On the monetary policy side, the central bank is doing a great job, maintaining the tight policy. You can only tame inflation with a full-scale program. As the fiscal authority, we are obliged to support monetary policy," Albayrak said. The full-scale fight against inflation program has also contributed to lowering inflation as it has created an immense psychological impact on markets. "We finished the year at 20.3 percent. This year, we are going to further reduce inflation down to levels of around 15 percent," he added. After the lira hit historic lows against the U.S. dollar in August, inflation hit over 25 percent in October, which compelled the central bank to raise interest rates. Lastly, the bank kept benchmark interest rates unchanged at 24 percent on Jan. 16. The minister drew attention to strong budget performance despite the major shocks that could have negatively impact the budget deficit. "The 1.9 percent budget deficit portrays the success of tight fiscal policy, and it points out a far better performance than 2009, the year when markets all around the world were shaken by the impact of the financial meltdown and Turkey's budget posted a 5.5 percent deficit in the GDP. Turkey's budget deficit stood at TL 72.6 billion in 2018, meeting a year-end target under the country's new economic program. Albayrak said that the central government budget deficit compared to GDP goal of 1.9 percent, laid out in NEP, has been met for 2018 and vowed to keep up this performance this year. According to NEP, the budget deficit/GDP ratio target is 1.8 percent this year, 1.9 percent next year, and 1.7 percent in 2021.